Our classic sheath dress comes in European wool that looks polished all day. We recommend a blazer for the whole “dress for the job you want” thing too. Made in NYC. Will ship in 5-6 weeks. Tailored, standard fit that skims the body. Waist seam falls at natural waist. Our model is 5’9” and wearing a size 4. We recommend sizing up if you are in-between sizes. Armhole re-shaped for maximum comfort and coverage. Bust dart adjusted to best fit a fuller chest. Curve of hem reshaped so that it can easily be worn untucked or tucked-in. For more details about the fit of our extended sizes, please see our page About Extended Sizing. 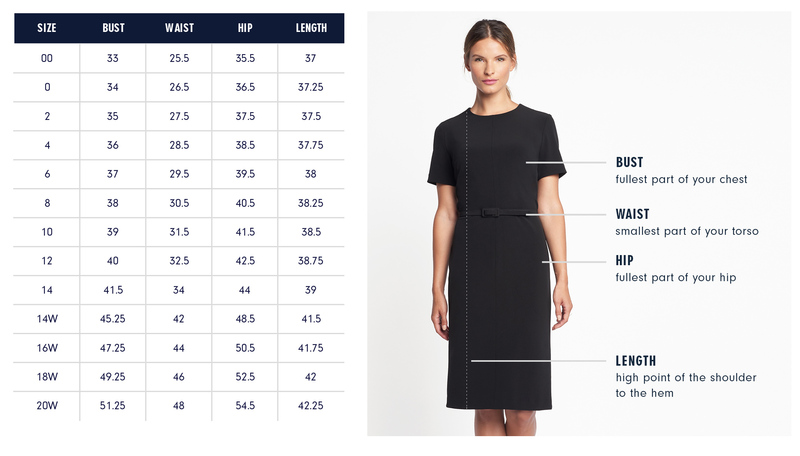 Below are the exact measurements of the Fifth Avenue dress. All measurements are in inches. For general brand fit, sizing, and measurements, please visit our Brand Fit & Size Guide. All of our clothing is fit to a professional fit model so that we can ensure our garments run true to size and our fit is consistent. Our fit model for sizes 00-14 wears an Of Mercer size 6. She is 5’8” / bust – 35 ½” / waist – 28” / hip - 38”. Our fit model for sizes 14W-20W wears an Of Mercer size 16W. She is 5’8” / bust – 46” / waist – 38 ½” / hip - 48 ½”. Tailored, standard fit that skims the body. Waist seam falls at natural waist. My favorite design detail of this dress is the V-shape of the back. It’s at once elegant and a little cheeky - an element of surprise in an otherwise classic silhouette. Features: Boat neck, slight v-shape in back, fully lined, vent at center back for ease of movement.